January 2017 – Page 2 – Let's Go RVing! We hated to see our Big Bend experience come to an end but it was time to move on so we broke camp and headed 106 miles to Fort Davis. Actually part of the drive we’d already seen as we had to go back to Alpine to get to Fort Davis. 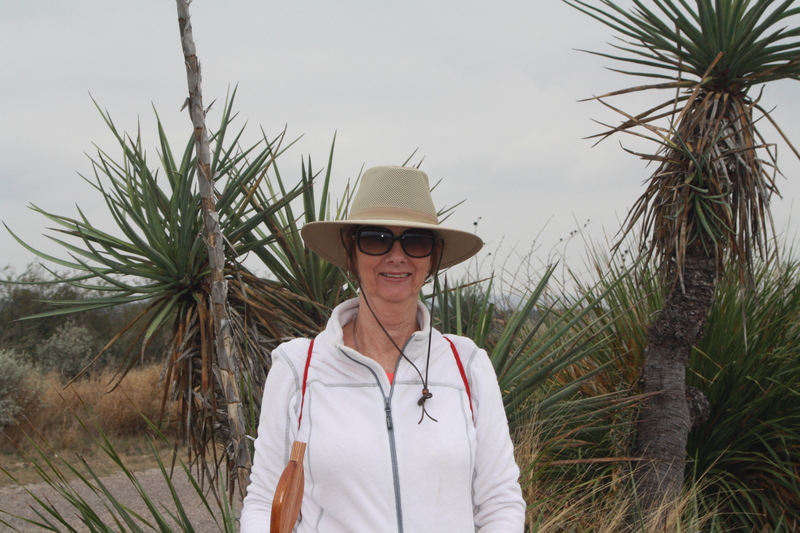 It was a pleasant easy drive although the wind picked up as we neared Fort Davis. (There was a high wind advisory)and we arrived at noon. The office at MacMillian RV Park was closed but there was a phone number posted on the door so I called. The man who answered said the lady who kept the office was sick and he was out on the road. He told me just to pick a spot and we’d settle up later. We picked a spot and began to to set up first taking the car off of the dolly. It was so very windy but we finally got everything done. As we were eating lunch the wind was buffeting us around and blowing the sides so that we decided to bring the living room slide in before we left. That seemed to be the one out affected. We rode out to MacDonald’s Observatory just to check things out. We knew they had a starlight program on Friday nights and reservations were necessary. It took us about 20 minutes to get there and upon arrival we found out that there were three separate programs. One at 2:00 for an hour and a half, the Twilight Tour at 5 for an hour and a half and the Star Party at 7:00. We realized that if we wanted to see all three we would not have time to return to the RV so we just spent the afternoon there. The first program was more interesting to Jerry than to me as it was very technical but after a talk of about 45 minutes we took the shuttle up to see two of the microscopes. That was awesome. The first microscope was the Harlan J. Smith and it is enclosed in a building with a top that opens when the microscope is in use. 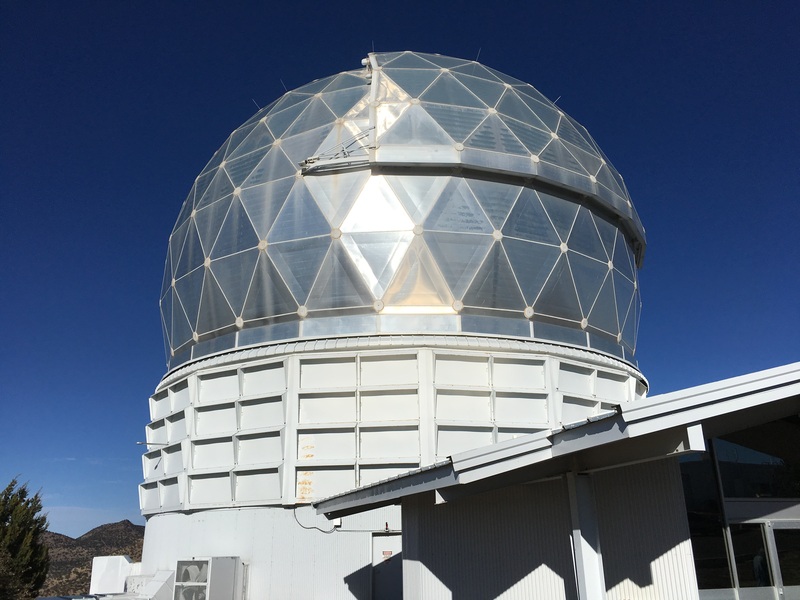 The second microscope, the Hobby-Eberly Telescope is so very difficult to operate that there are only four astronomers and their four assistants who are allowed to use it. If someone wants to use it for a research project they send the relevant information to MacDonald, the research is done there and then downloaded back to the originator of the project. I thoroughly enjoyed the second session. Our speaker, Kelly explained the various zodiacal constellations and their positions to each other. He had a very unique way of demonstrating it. It would be a great day to introduce it to children. He talked about the various planets, explained why Pluto was no longer considered a planet and showed everything in relation to the sun. I thought it was interesting that out of 3700+ members of International Astronomical Union only 400 voted to designate Pluto as a dwarf planet. Guess a quorum was not necessary. We got a quick bite to eat in the cafeteria and then we were ready for the star gazing – except we really weren’t. It was all outside and it was 39 degrees. I had worn my down coat but had on tennis shoes and golf socks and the thinnest pants I own. Jerry had on a heavy shirt and his State pullover. We were definitely not dressed to be outside for any length of time. Oh, did I mention that the wind was blowing? :). The first part of the program is held in an amphitheater and boy were those seats cold. We saw people who had brought blankets to sit on and wrap up in. Obviously they knew more than we did. The speaker had a laser pointer that could actually point out the various stars and constellations. That in itself was amazing. He pointed out the North Star, the Morning Star and numerous constellations plus the Milky Way galaxy. Afterward we went to various stations to look at the sky through telescopes. Unfortunately we only stopped at two stations as we were so terribly cold. Upon leaving we were directed to turn right out of the parking lot away from the Visitor’s Center so that our headlights would not shine toward the center and destroy the dark skies and any adjustment one’s eyes had made. An interesting point that was made was that from here east there is nowhere that the dark skies can really be observed due to the prevalent lighting of our cities. Also encroaching on this area are fracking companies which put off a lot of light. In fact we could see the glow of one of the companies. There is some sort of ordinance for seven surrounding counties regarding lights after dark. One corporate store opened and despite corporate instructions they turn the lights off every night. We came back to the campground and settled in for the night. We got an early start today, well, early for us because we wanted to do the Lost Mine Hike and the parking lot fills up quickly and if it’s full there’s nowhere to park, thus no hike. I think we got the last parking place around 10:00. I seem to be forgetting how long it takes to go anywhere in the park but at 45 miles an hour it’s a slow process over a good distance. When we got to the parking lot Jerry got out of the car and then quickly jumped back in and said put on whatever is in the car because it is really cold. I had opened the door and already knew it was a lot colder than the 45 degrees the car was showing. I had a t-shirt in the back and Jerry had a long sleeved t-shirt so right there in the parking lot we layered out clothing. Fortunately no one was around! We started the hike at 10:10 and it was all uphill which was good in that we’d be descending on our way back but the way up is challenging. According to the park newspaper the hike is 4.8 round trip. Of course my FitBit had it longer and I’m not sure where the hike ended according to the park. Whatever, it was a long uphill battle. We ascended 1100 feet by the time we reached the end and we had several rest stops. We stopped often because we were just out of breath and then also just to look at the beautiful scenery. When we’re hiking we are so focused on where we are stepping (and with good reason) that sometimes we fail to see the glory all around us. It is spectacular to say the least. Towards the end I started yawning and I knew I wasn’t sleepy so I wondered if perhaps the change in attitude was getting to me a bit. After all we are from the flat lands of Eastern North Carolina! Just before we hit the difficult rocky climb we chatted with another RVing couple from Iowa. She had made the climb before but he had not. We had a nice little visit and a nice rest which we needed because then the going got rough. It’s difficult to describe the surface we were walking on. Sometimes it was rocky and sometimes it was dirt and sometimes it was nothing but rock. Of course the wind had been blowing the entire time but it was beginning to pick up. Thank goodness for the walking stick that Jerry made. Without it I know I would have fallen at least once. There were also places where I’m not sure I could have made it without the stick. We finally reached the top so we stood around in the blowing wind and took some pictures. Wait a minute – what are those people doing over there? Nope, we were not at the end of the trail. There was more and it was an even more difficult climb with wind gusting probably 40-50 miles an hour. We got our to the plateau but could hardly enjoy it because of the wind. When the wind is blowing hard enough to blow my 200 pound husband around you can believe it was blowing me. Several times we just had to sit down to avoid being blown to – I don’t want to think where but it’s a long way down! It had taken us about 2 and a half hours to make the ascent. We started down and the wind was till blowing fiercely but we were going downhill so it was much easier. As we walked down we chatted with several people along the way some going up and some passing us on the way down. One couple had been to Boquillas yesterday and one couple was going tomorrow so we stood around and talked about that for a few minutes. We also heard some birds chattering but could never see them and our knowledge of birds is minimal at best. Jerry saw a blue bird, not a Blue Bird but a bird that was blue. I never saw any but it was pleasant listening to them sing. We finally made it to the car around 2:30 and what a welcomed sight that was. We decided to ride on up to the Bostolon Visitor’s Center to have our picnic lunch in order to free up a parking place. We sat at the picnic table and enjoyed our chicken salad sandwiches and yes, I’m Southern – I had my sweet tea! We discussed then what to do next. 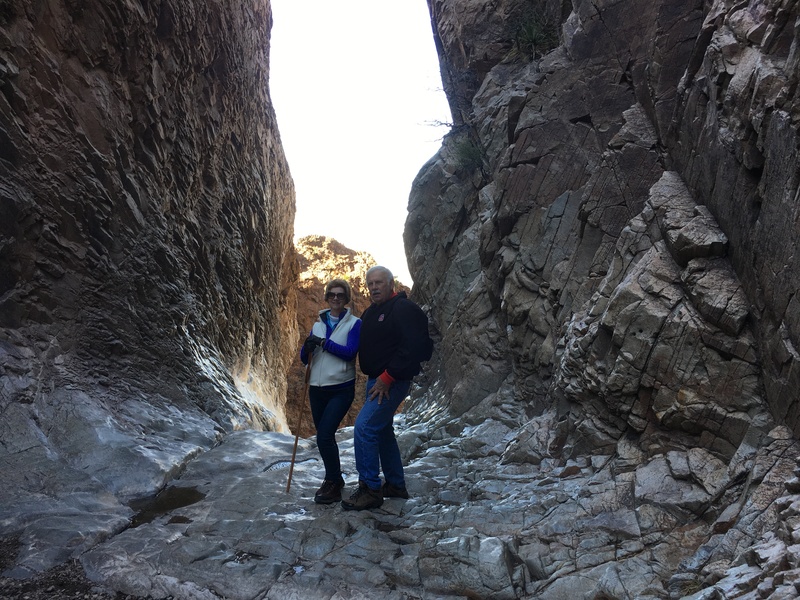 We had been told that access to Santa Elena Canyon was possible now and we both wanted to see that but we knew we were tired. We also knew that we would probably never be in Big Bend again so what to do? We decided we’d ride down the Ross Maxwell Drive again – it is a beautiful drive – and then determine when we got there whether we felt we could accomplish another hike even one that’s only a mile and a half round trip. This is what we walked through to get to the river! We did it! We made it to Santa Elena and drug out of the car, took a second breath and off we went through the bushes and the brambles to try to find the rock path across the river and the muddy path to the other side. We finally found it although I’m pretty sure it was not the choice path as we literally slid down sand dunes and scrambled though briers and bushes but we got to the other side and then began the ascent and then descent to the bottom of the Santa Elena Canyon. On the way we met several people that we had seen on the Lost Mine Trail but they were a lot younger and more energetic and where quite impressed with us! The view at the bottom of the canyon is absolutely stunning especially at the time we were there which was around 5:30. Our photography skills and cameras cannot do it justice and my limited vocabulary cannot adequately describe it. Adjectives like majestic, awesome, and grand simply fail. As we were walking out we met a young couple from Oklahoma and chatted with them as we walked. 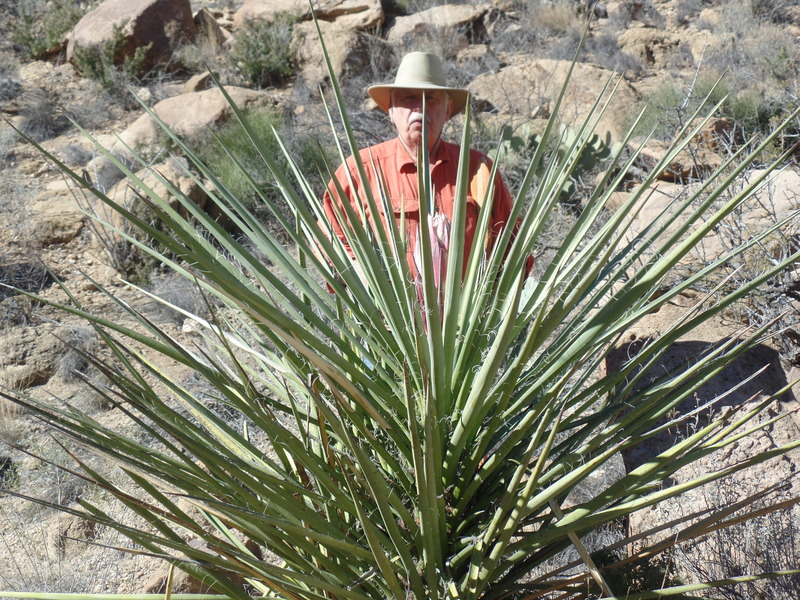 He had been to Big Bend several times and even been to Santa Elena. We talked as we walked out and surprise – there was an easier way. 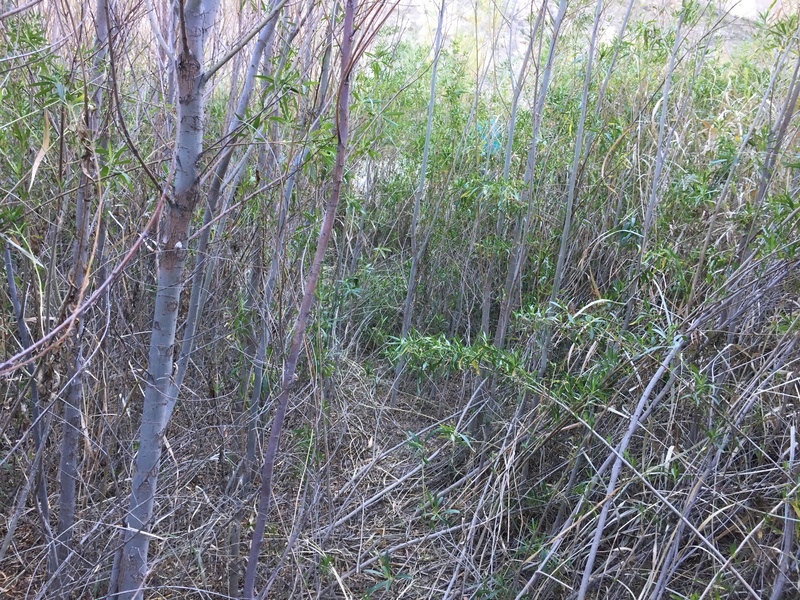 We walked through a wooded trail along the river bank but it was a marked trail and not difficult to follow. A dirt trodden path going across the river where many feet have trod led us to the other side. We were tired when we got back to the car but so glad we did it. Jerry had asked me earlier to remind him after we left Santa Elena to stop and take a picture on the way out so I did and we actually stopped so he could take a picture of a mountain that appeared to have a square rectangle in it. Again, amazing! To cap off the trip we realized that we were going to be in a perfect place to see the sun set if we could make it to Sotol Vista in time. We hurried down the highway and were just in time to see a glorious sunset. God in all of His glory! Spectacular is to mild a word. 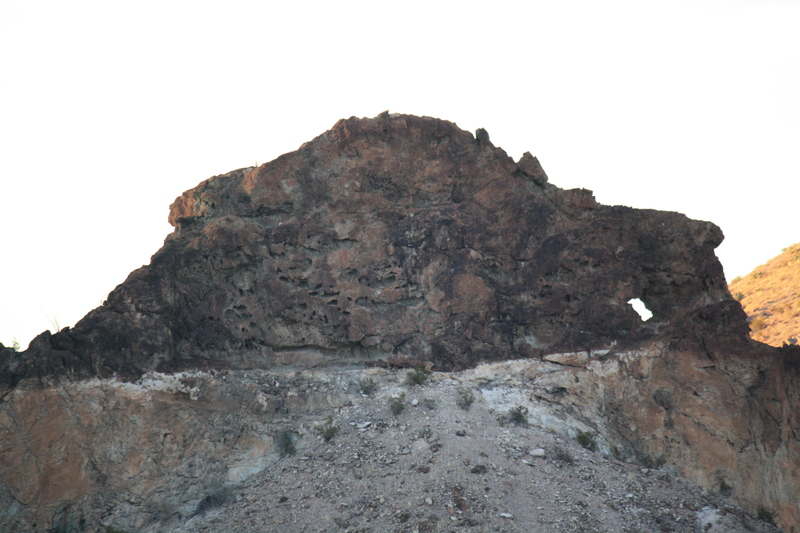 We left the park at 6:50 – a very full day and tiring day but oh my, what a way to end a visit to Big Bend. A quick stop at the local grocery store and on to the motor home. We had talked about going back into Big Bend tonight for some star gazing but it was just not to be on this trip. Of all the trips that we have taken this is the first trip that Jerry has said he like to do again. It was grand! We started our day early as we had planned to go to Boquillas, Mexico today. 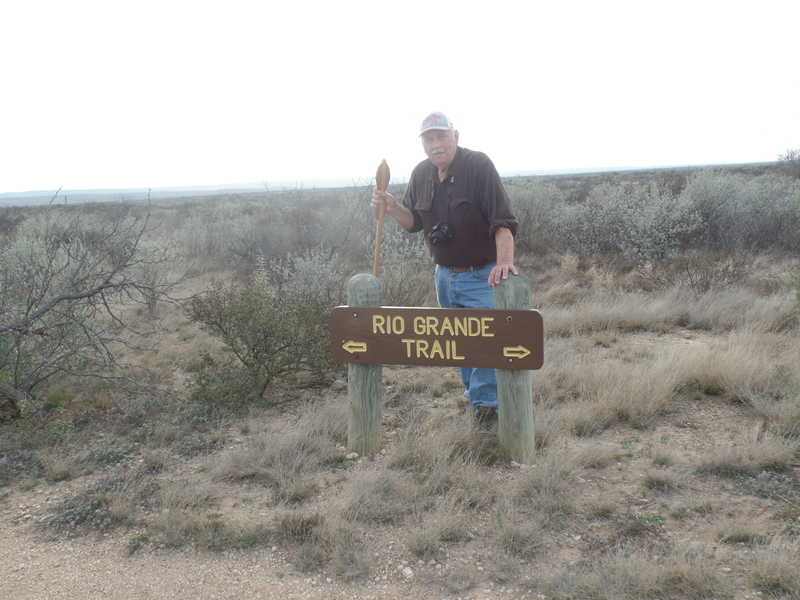 It’s about a 40 mile trip all the way through the Park from Terlingua to the Rio Grande. We stopped in Terlingua and got gas at $2.70 plus and then I drove for a change while Jerry fiddled with his camera and took numerous pictures. 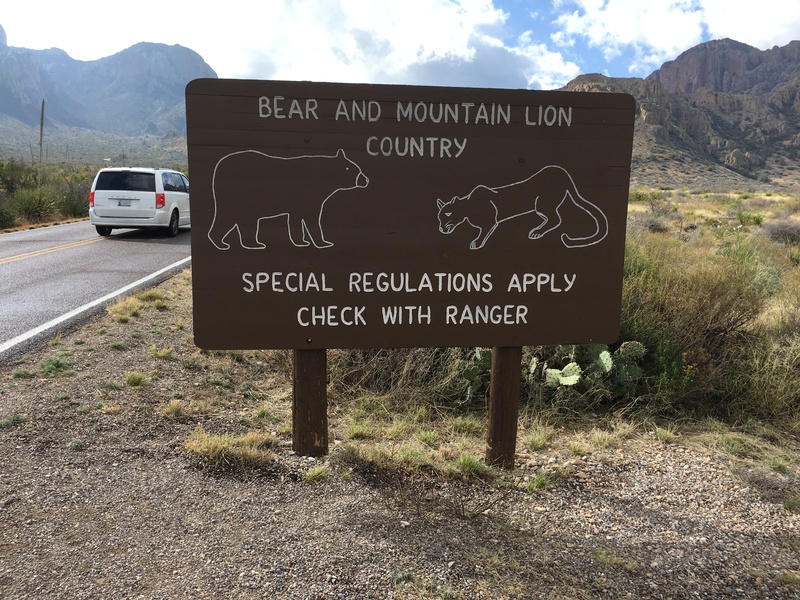 As we entered Big Bend we stopped to get another picture under the sign as the ones we took the other day were not good. Further down the road we stopped at Panther Junction as Jerry wanted to show a ranger a small piece of rock that he had found at Lower Burro Mesa Pour-off when he climbed up the mountain side. It was multi-colored with pinks and blues. 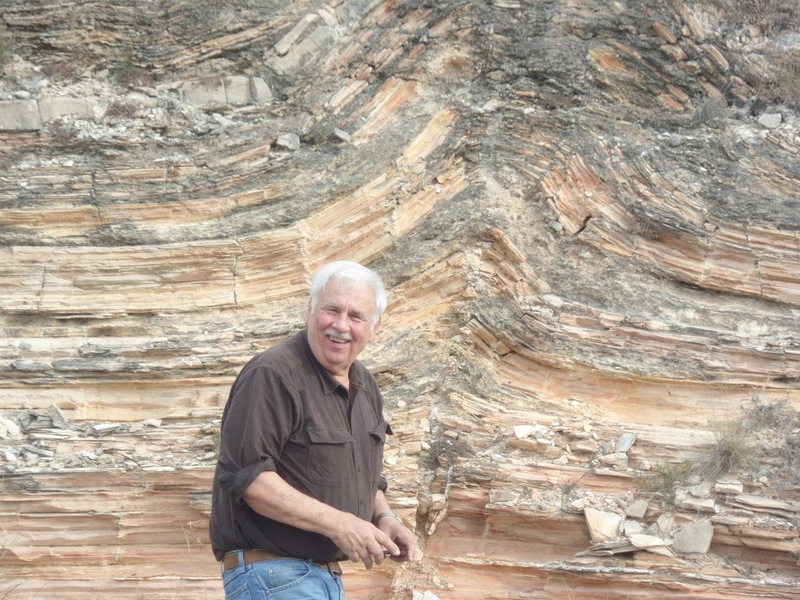 Jerry showed it to the ranger and the ranger said he had never seen anything like it before and would give it to a geologist. We reached the Boquillas crossing and there was not another car in the parking lot. Umm, a little quiet today. We went on into the office and the ranger explained the procedure to us. About the same time a couple from Oregon, Karen and Mike, came in and we ended up enjoying the trip together. We walked about 200 yards down to the Rio Grande where we got into a row boat and then were taken across the narrow crossing. The water was very muddy and flowing fairly strong but the guy rowed across with no trouble. When we got to the other side we paid $5 for the round trip and received tickets to be presented for the ride back. Then we were asked how we wanted to get to the village. 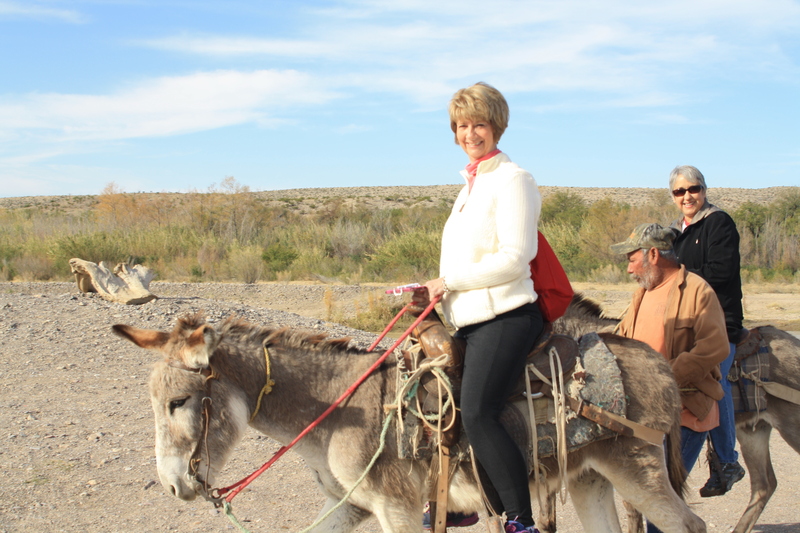 Karen and I elected to ride a burro while Jerry and Mike walked. Jerry and Mike were much faster than Karen and me. I could not make my burro who apparently lost half of one of his ears at some point go any faster. I could steer him out of the way of approaching vehicles but we got no faster, no slower. When we reached the village we went directly to the immigration office which was closed! In fact we never showed our passports. Apparently 11:00 is a little early to visit as we noticed that the ladies were just putting out their wares. There were several stands with embroidery pieces and some were quite well done but I didn’t see anything that I thought I could use. Our guide who spoke very little English showed us around the village. Fortunately Karen could speak Spanish so she was able to ask some questions for us. It is a very small typical Mexican village whose main source of income is tourism. I was astonished to see that had they Wi-Fi and solar street lights. He took us by the school where there was one teacher and approximately 25 children. The town also has a hospital although it didn’t seem to be opened. We saw the local church which was painted yellow. I went inside and it only had a few pews. There were a lot of dogs running around and quite a number of horses. I asked what the horses were used for and the answer was “tourism”. We were only approached once, well twice, once going into the village and once returning to buy something. A cute little boy ran out in the street with a metal figurine that he offered for sale. After our “tour” we went to Jose Falcons for snacks. As we walked I heard a good old southern accent and talked briefly with a gentleman from Greensboro. The lady who owned the restaurant spoke English quite well so we had no trouble ordering. Jerry and I bought salsa and chips for the group and Karen and Mike bought the guide a drink. I had quesadilla and Jerry had tacos made with cabbage. Both were very good but not very filling. We both had cokes, me a regular and Jerry a diet. We were told that cokes in Mexico are sweeter and more like the original coke because they are sweetened with pure cane sugar. I really didn’t notice any difference but then I probably wouldn’t because I rarely drink soft drinks. We mounted our trusty burros again and back to the river side we went albeit slowly! When we got back to the United States we had to check in and have our passports scanned. I was wondering how we would check back in as it would appear that we had never checked into Mexico but there was no problem. 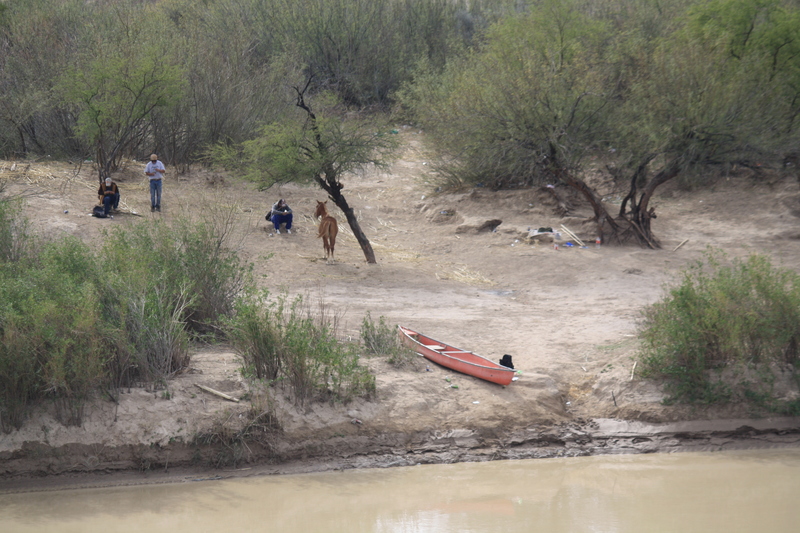 We rode up to Boquillas Canyon Overlook and by gosh, there on the other side of the Rio Grande was a canoe and two or three people plus another burro and a horse. At the edge of the overlook was a sand dune slide to the river. I guess the canoe would come over and pick you up and take you to the Mexican side. Interesting. I’m not sure where you’d go once you got over because the closest city is 180 miles away. That’s where the manager of the restaurant has to go for groceries! It was a little awesome standing on the banks of the Rio Grande but it looked a lot different than what I would have expected. Very muddy and silky and I wouldn’t want to put my feet in it but I understand there are fish in it. Amazing! We rode down to where the trail to the very top of the canyon started but elected not to do that today. Instead we headed back to the motor home to do some much needed chores. Along the way we kept stopping to take pictures of the landscape. It is amazing how different things look depending on whether you are traveling east or west. The sun can make all the difference in the world in just a few seconds. It is definitely beautiful country. I got up this morning with no idea what Jerry had planned as I had told him that today was his planning day. He decided to do the Ross Maxwell Scenic Drive with perhaps a hike along the way. We finally stopped at the Big Bend Monument to get a few pictures and then headed on. As we drove along I saw my first roadrunner. Boy is he fast and smaller than I expected. Our plan was to talk with the ranger at the entrance to get some information but the station was closed. Jerry realized that we were low on gas so he suggested going on to Panther’s Junction to get gas at the nearby store plus we could mail the postcards. As we neared Panther’s Junction Jerry asked where the entry point to Boquillas was and I told him Rio Grande Village so he suggested that we go on and do the Mexican entry today. OK – change of plans. When we got to the gas station a tanker was filling up the tanks so we couldn’t get gas for about 15 minutes so we went to the Visitor’s Center and talked with a ranger – fortunately. The entry to Boquillas is closed on Mondays and Tuesdays so another change of plans. He suggested several hikes along the Ross Maxwell Drive. After leaving there we went back to the gas station where we paid $2.80 a gallon. We only got $20 worth but that will get us where we’re going and to cheaper gas! As we drove along Jerry had seen a particular rock formation that he wanted to photograph so we came up on it we pulled off of the road and climbed up to get a good view and he took a couple of pictures. A little further up the highway we realized we could get a closer picture so we stopped again for a photo op. The Ross Maxwell Scenic Drive is lovely with views of the Chicos Mountains all around. Everywhere you look, right, left and straight ahead are mountains. The mountains just seem to flow on one side with jagged points on the other side. Obviously they defy description. The first place we stopped was the old ranch site of Sam Nail. We wandered around the ruins of the home. There were two windmills and one was still working, pumping away. 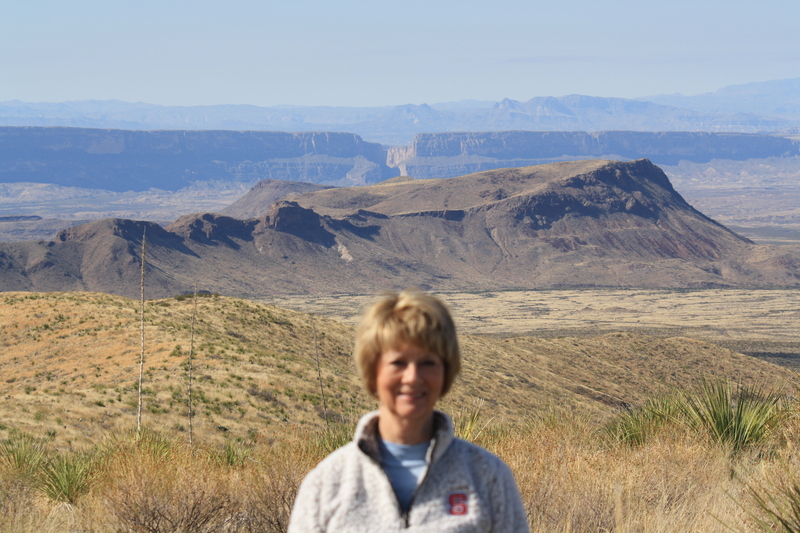 Our next stop was an overlook at Sotol Vista where we gazed toward Mexico, the Rio Grande and Santa Elena Canyon. From this vantage point Santa Elena appears rather small but at the mouth of the gorge the limestone walls tower 1500 feet above the river. Also at this overlook was an explanation of how fire plays a role in the part of the ecosystem being neither bad nor good, just a part of nature just like rain, wind and flood. I remember hearing this when we were in the North Carolina mountains as the fire clears out the underbrush. We decided to hike the Lower Burro Mesa Pour-Off instead of the Upper so we drove on there. When we arrived in the parking lot there was no one around, just us and the beautiful surroundings. There was a brick bench there so we decided to have our picnic lunch there before undertaking the short mile hike. After devouring our chicken salad sandwiches we took off. By this time a gentleman with obvious photography skills had joined us. The trail was easy and well-marked and we got there in it a short while. Looking up at the Upper Burro Pour-Off is beyond description. Our limited photography skills cannot describe the height or depth of such but we tried as we took picture after picture. On the way back Jerry decided to climb a very high slanted hill to reach a structure – why? I guess to say he did it but he found that descending was much more difficult than ascending. By the time he reached the bottom he was exhausted and wondering why he had elected to do it. In fact, he said to please stop him if he ever decided to do something like that again. I have several pictures of his backside! We continued on down Ross Maxwell Drive marveling at the constant beauty unfolding before us. The colors are ever changing – pinks, reds, oranges, yellows, greens, salmons, browns, grays, and even blacks are just a few. We stopped at Tuff Canyon, a very deep dry wash. We elected not to do the short hike though as we had others that we wanted to do. Our next stop was the Castolon Visitor’s Center, a small center not opened during the summer. There were a number of people there though, some of them camping at the nearby campgrounds. 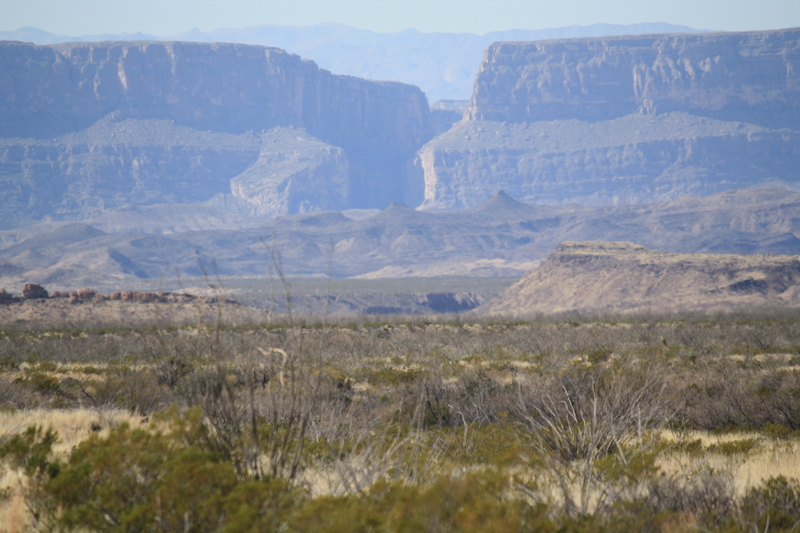 With anticipation we headed toward Santa Elena Canyon. Wow – majestic, towering – there are no words. When we arrived at the parking lot we were up for the task of hiking as far as we could go. 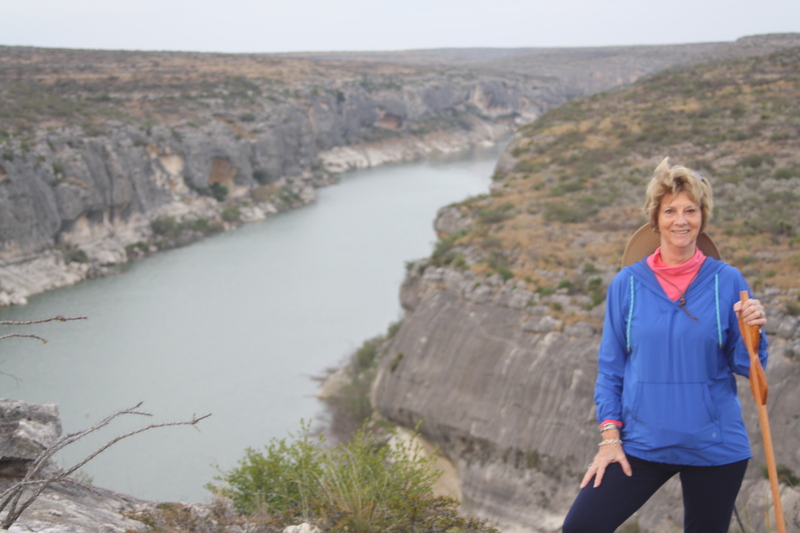 We stopped to look at the Terlingua River and it was dry however as we neared the section where we would have to cross over the water was flowing and where there was no water, it was quite muddy. We saw some people who were barefooted and said they’d rather clean their muddy feet than their muddy shoes. After wandering through several paths we decided that we didn’t want to clean either so we would not be tackling the canyon wall. It was very disappointing but we did get to see the canyon in all its grandeur. Our next stop was the Dorian-Sublett Trail but Jerry said he was just too tired to try it plus his foot was bothering him so I got out and wandered around. I got pictures of the remnants of the stone farmhouse owned by James and Melissa Bele Sublett, settlers who first came to the area in 1913. Sublett is recognized for introducing mechanized farming into the Big Bend. On the way out of Ross Maxwell Drive we made a couple of stops to take some pictures. The skyline is incredible and we kept trying to get good pictures without the highway being in them. Not as easy as you’d think! 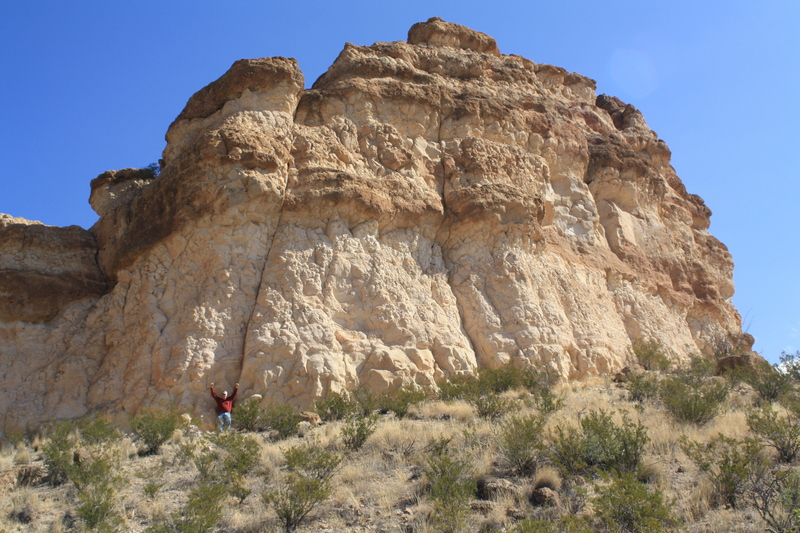 We also stopped at what at first appeared to be just white rock but was actually layers of volcanic events. 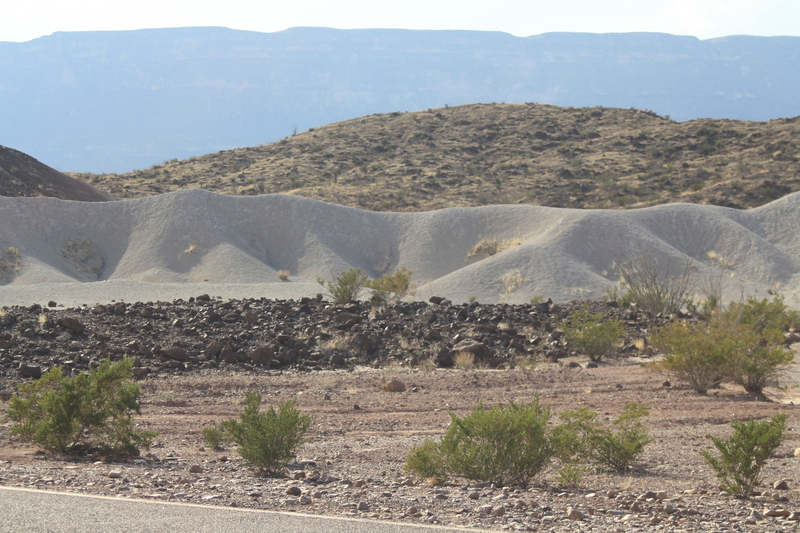 Stacked within the Cherri Castellan are several lava flows and volcanic ash deposits with layers of gravel and clay from periods of erosion between eruptions. 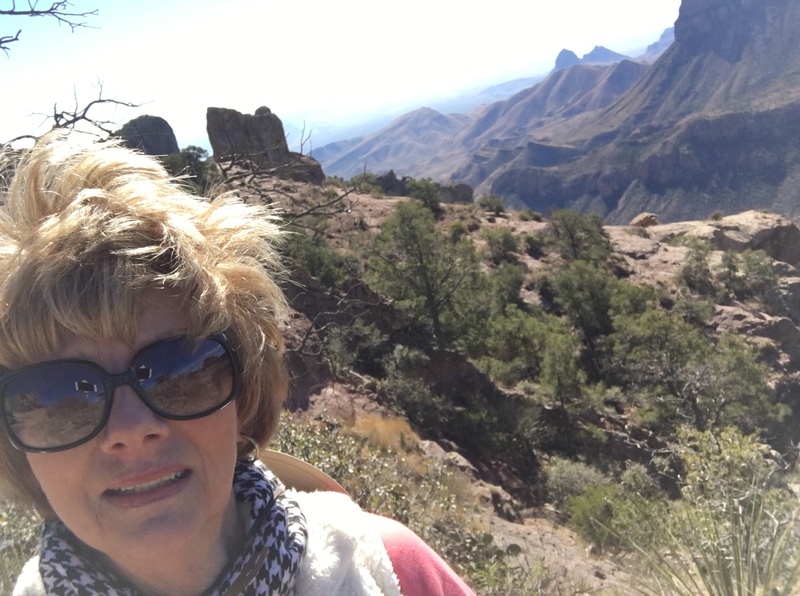 We had earlier talked about hiking Mule Ears Peak but it was an almost 4 mile hike so we knew it was too late to do it. As we rode back though we did stop at the Mule Ears Peaks View Overlook and I was surprised to find out the peaks that I had been calling the Twin Peaks were actually Mule Ears, very recognizable from a distance. Around 7:00 we rode back to Big Bend as the ranger had earlier told us that star gazing would be good on Old Maverick Road. Jerry drove just a little way down that road and quickly decided that it was too rough for our car so we came back out to the main Big Bend highway and rode until we found an exhibit station. We stopped there and then realized that it just wasn’t dark enough so after a few minutes we came on back to the campground. If we try it another night we’ll go a little later. Neither of us slept well last night for a couple of reasons. We were beyond tired plus our legs bothered us all night. I think we did too much yesterday. I finally got up a little after 12:30, took another Aleve and moved to the sofa. That way I could sleep on my back with my legs stretched out. I finally managed to sleep until a little after 7:00. Think we will have an easier day today. 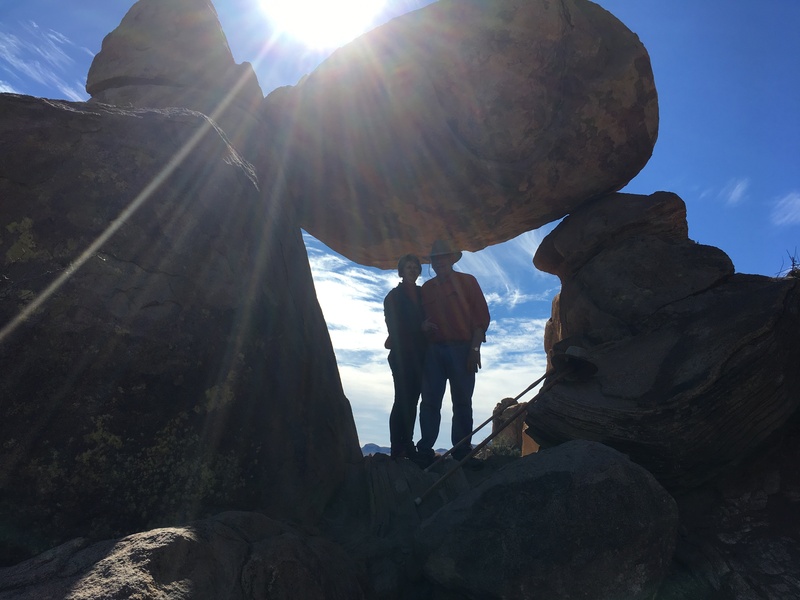 We started out a little earlier this morning on our way to the Rio Grande Village with a stop at Grapevine Hills Trail for a look at the Balanced Rock. Before we left Jerry spoke briefly with the camp host who is from Alberta, Canada. She said this was her third year wintering here as she like the warmer weather (Brrr, not too warm to us us I guess compared to Alberta, it is warmer) and the peace and quiet. BJ’s is a small park with few amenities but it does have good Wi-Fi so when we have the energy we can update the blog. We left on our way to Grapevine Hills trail and suddenly realized that there were several cars stopped in the highway. There was a coyote in the road and he was thoroughly unconcerned with the traffic. One lady got out of the car to take a picture and when she opened her door he turned to walk away and I thought he’d leave but he didn’t. We were able to get several good shots of him. He is the only animal other than birds that we have seen. I questioned Jerry as to whether the cold January weather made any difference in the sightings. 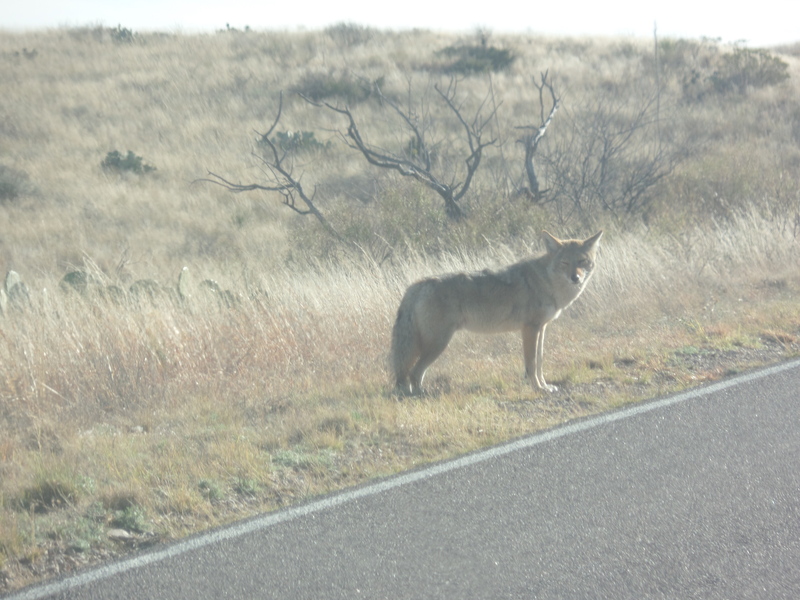 We ended up seeing probably the same coyote three times which led us to believe that he has been habituated. 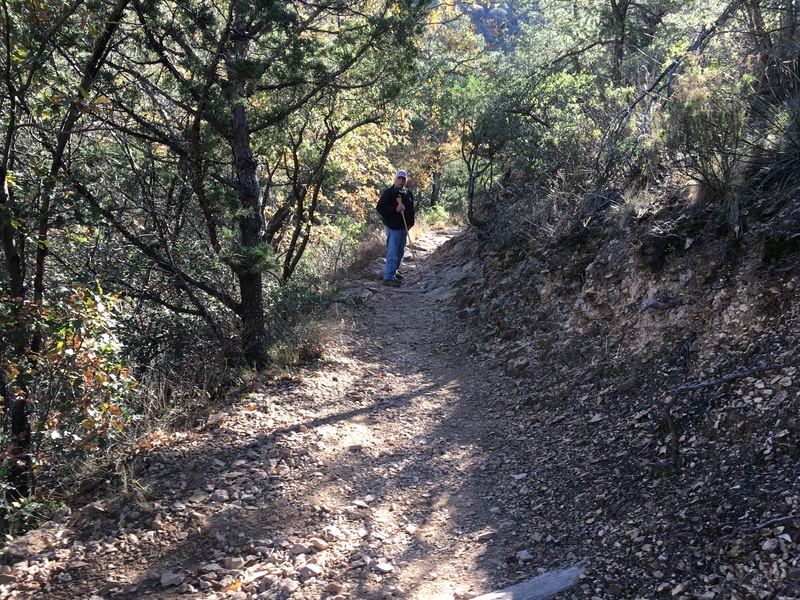 We turned on a very rocky six mile road to Grapevine Hills / Balanced Rock trail. It’s six miles long and Jerry was riding along with his foot not even touching the gas pedal. At this rate it would take a while! In fact, it probably took about 45 minutes to go the 6 miles to the parking lot to get to the trail for the Balanced Rock. Along the way we met a van with a lady driver plus a B+ Motor Home so I knew we could make it in our little car. The trail starts off very easy. It’s a sandy walkway well marked. The grandeur of the surrounding rocks is indescribable and the formation is astonishing. One rock may look like a boot lying on its side. 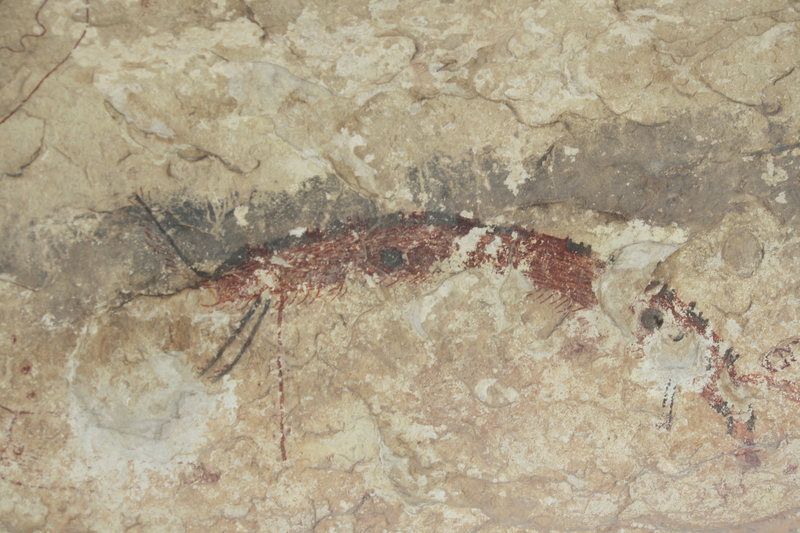 Another may resemble a turtle. The last ¼ mile is quite different as it is a rock climbing adventure. Jerry said there might be some jackasses in the Walton family but as far as he knew there were no mountain goats and that would have come in handy during that climb. It was well worth it though. We snapped some pictures and then some more people came up so we were able to get a picture of the two of us under the Balanced Rock. We started the trek back down and I even scooted on my behind at one time. Thank goodness for our walking sticks as I’m not sure we could safely have made it to the top. 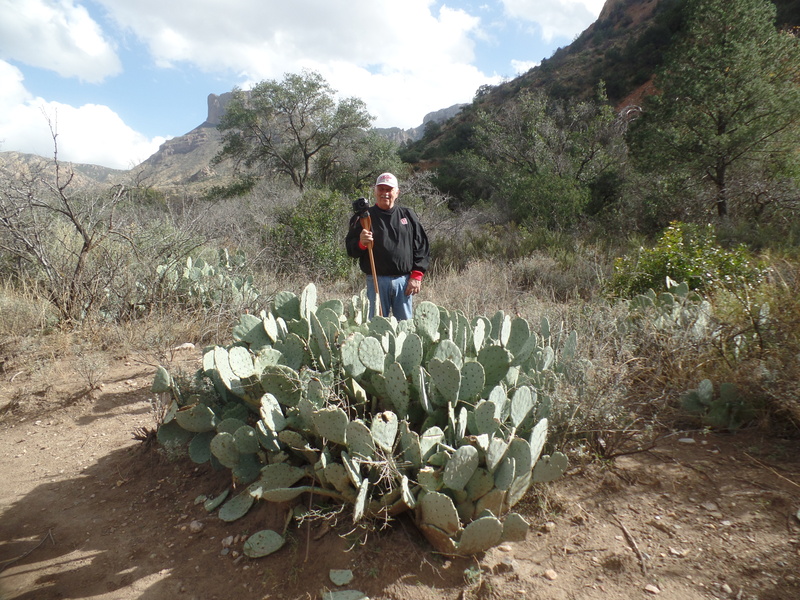 After we got back down to the “easy” trail Jerry suddenly exclaimed look at the cactus except I don’t think it’s a cactus, maybe a yucca plant. It was blooming. We had walked right by it on the way up and didn’t notice it. It was the only one we saw and as we met the various folks on the trail we told them about it so they’d be sure to see it. Back to the car and we decided that we’d have lunch at a picnic area Jerry had seen on the way in however we eventually changed our minds and ate in the car as we slowly drove along. It was a slow ride. 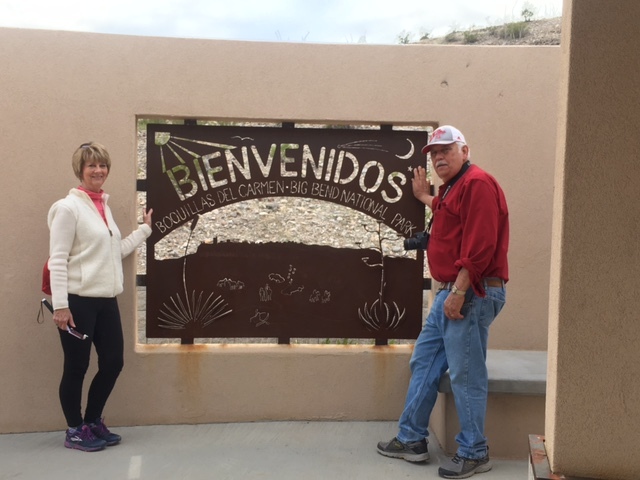 Our next stop was the Visitor’s Center at Rio Grande and then a quick trip into Rio Grande Village which as it turned out consists of a small store, a campground and a laundry. We then decided to go the the Hot Springs. 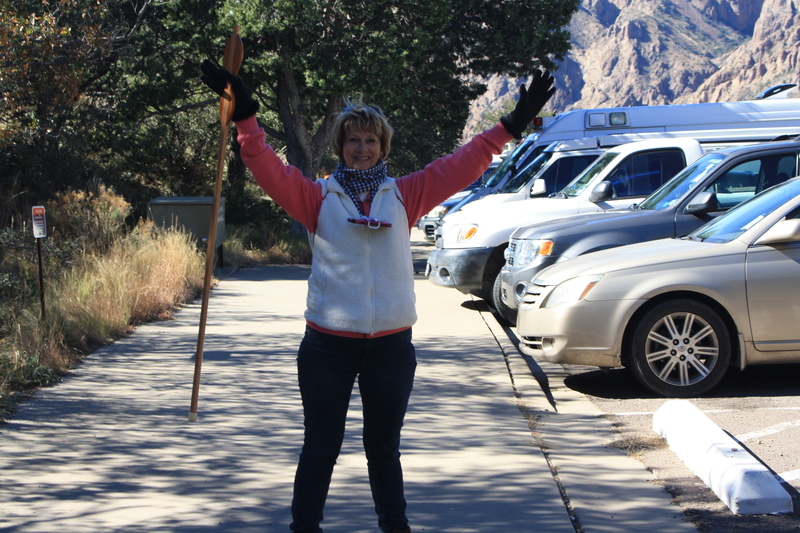 The hike was 3 miles round trip and Jerry and I both knew we were too tired to do that so we stopped by the Visitor’s Center again and found that we could drive within ¼ mile of the springs so that’s what we did. 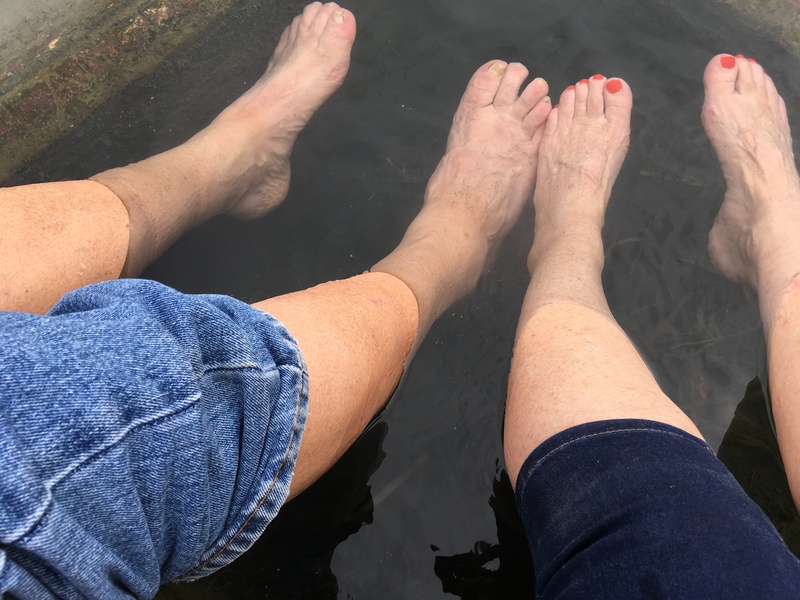 I will say that putting my tired feet in that 105 degree water felt wonderful although it appeared to be very muddy. Maybe it was a hot springs with a mud bath! I only wish I could have immersed my aching legs! Next stop was Panther’s Junction visitor’s Center to get some postcards to send to each of the grands. Since it was nearing 5:00 we headed on to “the house” and decided we mail the cards tomorrow. Although I had planned to cook tonight we decided sandwiches would be the fare for the night. We also discussed slowing down a bit. We have been going full steam ahead and we have to slow down a bit so tomorrow may be a slower day. We talked about a short hike in the morning, return to the campground for rest and watching the sunset at Santa Elena if weather permits. When we got to Terlingua we stopped at Cottonwood Market to buy some bread, mayo, etc. and then went on to the campground where I collapsed on the bed for a while. Pure exhaustion but a good exhaustion. We ended up taking chili out of the freezer for dinner. Afterward I spent some time downloading pictures and then turned in. Exhausting, Exhilarating, Semi-Dangerous – that was today! We headed to Panther’s Junction in Big Bend National Park around 10:00. Several people had said that we could talk with a ranger telling them how long we would be visiting the park and they would help plan our visit. That may be but it wasn’t for us. We spoke briefly with a ranger who gave us about a 2 minute spiel and then Jerry and I looked at each other with looks of confusion hoping that one of us had gotten a little bit of what she said. We didn’t! Oh well, we then watched a really good video on Big Bend. I would love to have had a copy as there was so much information in there that we could hardly retain even a small portion. We made a few purchases and the lady that checked us out was very helpful giving us some pointers on what we might do for the afternoon. Now why would I want to do this? BTW, we never saw anything! 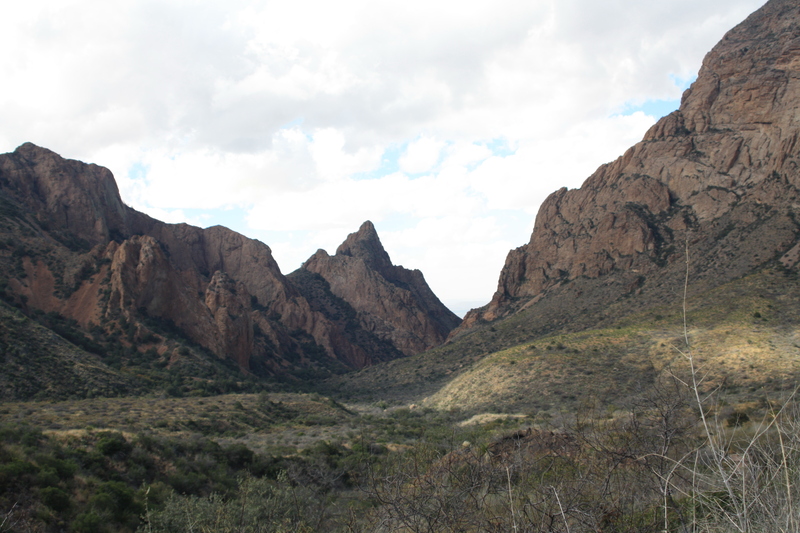 We ended up going back to the Chisos Basis Trailhead to hike the Window Trail. The sign says its 5 miles. Don’t be fooled. According to my FitBit which may or may not be correct we hiked 7.4 miles! When we finally got to the Visitor’s Center it was teeming with people just wandering around. We did realize that the Visitor’s Center itself was closed for lunch from 12 to 1 but there was a store opened where we could buy various items. We ended up buying a bag of potato chips to go along with our chicken salad sandwiches. Before our walk we opted to have our lunch at a picnic table but once we got there we realized it was a bit chilly so we quickly got back in the car and ate there. Just as we were getting ready to get out the rain came. It didn’t rain long so we got out to start again. And then a big thunder boomer sent us hustling back to the car for a few minutes. It stopped raining, I got out of the car and headed for the building and it started up again. Jerry stayed in the car and I stood under a ledge of the building. Only 15 days of rain annually and it rains the day we’re there! It finally stopped and off we went. I’m not sure what I expected and apparently I didn’t read the sign very well. The information we were given list the trail as moderate. Well, I surely don’t want to see a strenuous trail because this trail was difficult for us, one like we’ve never done before. The path was not smooth at all, littered with rocks of all sizes and included a lot of switchbacks. I had not read enough to know what to expect at the end and I discovered that I don’t hike for the joy of hiking. I want something at the end of the trail and I was totally unsure of what if anything was there. We met one couple who said there was a waterfall there but you couldn’t get to it due to the danger. Little did they know. As we neared the end of the trail we met a young lady who had earlier jogged by us with her service dog. She warned us about the danger of approaching the window and said it scared her and spooked her dog and she is a pretty seasoned hiker who has done this trail before. The wind was so strong that it blew her bandana right off her head. When we got to the end of the trail it was so very treacherous. We had already faced very blustery winds going through the walls of the canyons but when we got closer to the Window it really started blowing hard. We opted not to go any further but when others went before us we decided to go as far as we could. Before we proceeded Jerry took his cap off and laid it down putting a rock in it to secure it. He knew it would blow off as he climbed. I took my cap off as well and put it in his adding another rock. As I was climbing up the wet rocks a wind gust of probably 40-50 miles hit me and I nearly fell. Jerry said that was it – we weren’t going any further but then the wind slowed down some so on we went. We reached the top of the rocks, had our picture taken and very carefully but quickly went down. It probably was not a wise thing to do but in for a penny, in for a pound. When we got back to where we had left the hats we found them floating in the stream. Oh well, at least we had them. We then started the 3 mile plus hike back to the Visitor’s Center. The trail is very well marked but it is not a smooth trail as it is very rocky and uneven. We were also descending on the way in and ascending on the way out – not a good idea for me! It was a difficult hike for us, the most difficult we’ve ever undertaken. I was glad we had bought the hiking boots as I think my tennis shoes would not have been sufficient. 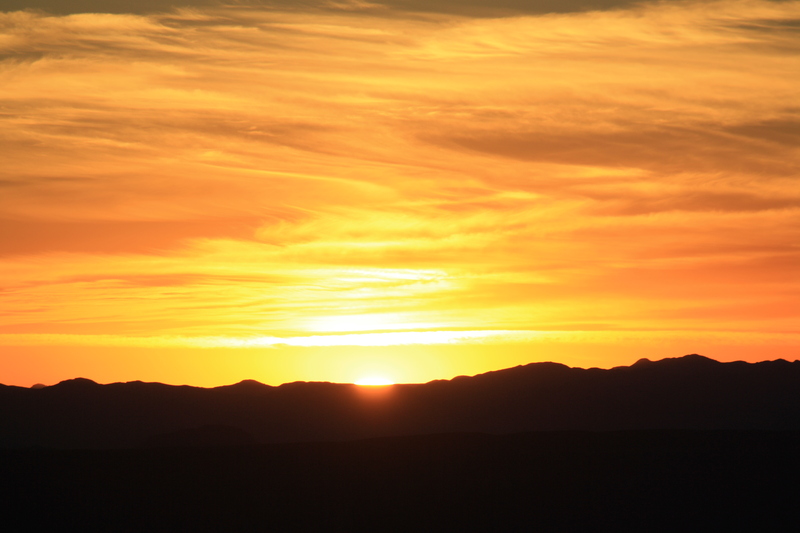 On the ride back to Terlingua we watched the sun as it set above the mountains. This is the first day that the sky has been clear enough to even see the sun. We stopped by the RV briefly for Jerry to change shoes and then we headed to the Starlight Theater for dinner. It supposedly is one of the iconic things to do in Terlingua and since we had not made plans for dinner this was a good night to do it. We didn’t realize that all of the people standing on the porch were probably waiting for tables so we went on in and gave our name to the hostess. We stood waiting for at least 30 minutes and by the time we were seated I thought my feet would fall off. We both ended up getting burgers. They were good but nothing like the Gristmill, Blackwater Jacks or Chimney Rock. Guess we are a little spoiled by now. We got back to the campground a title after 8:00 but I felt like it was much later. We were both exhausted but too tired to go to sleep. I downloaded some pictures onto Google photos and then tried to put my aching, tired body to bed. Yes, it was an exhausting and semi-dangerous day but a great way to spend out first day in Big Bend. We just can’t get away early! Despite all efforts it was 8:30 before we pulled out of Seminole Canyon State Park this morning and we only drove about 30 miles before we made our first stop which was at the Visitor’s Center and restored home of Judge Roy Bean in Langtry. We turned off of the highway which always makes us a little nervous as we don’t want to get in a situation we can’t get out of. We found out later that we were on a loop road so no worry. There really was nowhere to park so we just stopped in front of the center in the no parking zone and I went in to ask where we could park and were told we could stay right where we were. The Texas Department of Transportation has a Visitor’s Center connected to the museum and the ladies working there couldn’t have been nicer. They immediately asked where we were headed and began to gather relevant brochures for us. Before our self-guided tour we watched a short video on Judge Bean which had obviously been done years ago but was still providing correct information. 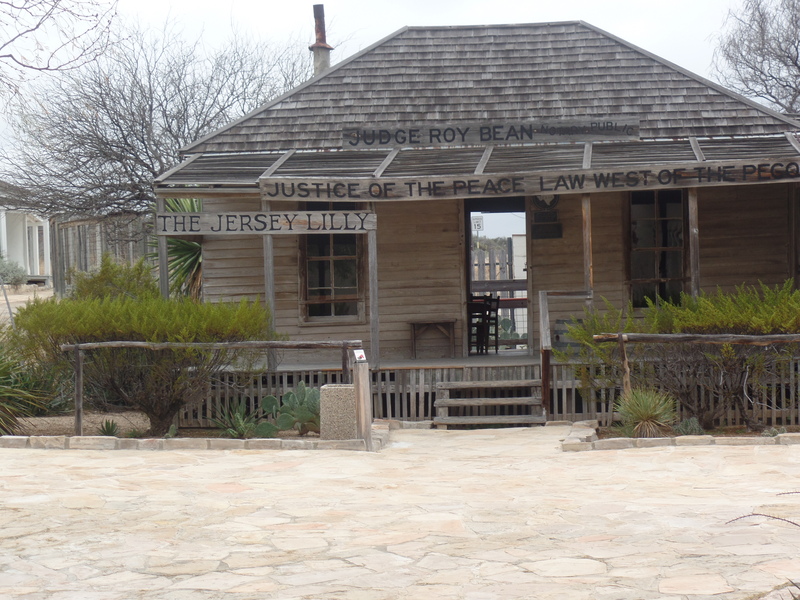 We left the brochures on the counter and began the tour of Judge Roy Bean’s saloon and the Opera House (his home). Legend has it that the town was named after Judge Bean’s idol, Lillie Langtry. He had numerous pictures of her decorating the saloon and he wrote to her many times inviting her to visit Langtry. She eventually did but unfortunately it was a few months after Judge Bean’s death. In speaking to the assembled peopled she told them that she felt as though she knew them from the letters that Judge Bean had written to her. After touring the buildings we walked through the cactus garden. It is lovely and filled with many different varieties and each of them labeled with a bit of information about them. Had the weather been nicer – it was very windy and a little cool – I’m sure we would stayed longer but with the wind it was getting cooler. We left and headed to Marathon where the Gage Hotel is located. I had heard that it was absolutely essential that one stop at the Gage to see the beautiful architecture and eat in the wonderful restaurant. Well, the lobby of the hotel is pretty impressive but the restaurant doesn’t open until 6:00 so we were out of luck there. We drove on and ended up stopping in Alpine and parking the coach at the athletic field of Sul Ross State University where we just ate what we had. The drive from Alpine to Terlingua was at times harrowing. We had been in light rain since we left Langtry but after Alpine the fog set in plus we were in mountainous country. As usual Jerry did a fantastic job but at times his visibility was very limited. Due to that we didn’t make very good time finally arriving at BJ’s a little after 3:00. It didn’t take long to set up although we are still having some trouble with the jacks. As soon as we could we set off to get the lay of the land and actually headed toward Big Bend. I cannot possibly describe the majesty of these mountains. They are absolutely mesmerizing. The various colors all seem to seamlessly blend and it is just such an amazing site. I don’t think I’ve seen anything more beautiful and I can hardly wait to see them up close. We rode to the entrance to the park where the ranger explained that we would need a car pass and with our America the Beautiful pass entrance was free for 7 days. He gave us some literature and some suggestions. Since it was nearly 5:00 we returned to Terlingua and then drove on to Terlingua Ghost Town. Wow – there’s a teepee there and a lot of small adobe homes. It’s like something out of a picture book. Needless to say it’s really authentic, nothing touristy about it at all. We continued on to the Starlight Theater where we were thinking about having dinner but the lines were already long so we decided to go on back to the campground and think about dinner there another night. I prepared some potatoes au gratin and we warmed up leftovers for dinner. When we woke up this morning it was so soupy foggy that we could hardly see beyond our site. I knew there would be no viewing of a sunrise today. Since it was also misting rain we decided to go into Del Rio and see if we could find some gas for the Avalon. We are pretty sure we have enough for the motor home but if push comes to shove we can always siphon some of the car gas into the RV. Well, at least Jerry can! On the way into Del Rio I mentioned that I wished I had some good hiking boots. I have good walking tennis shoes but I’m afraid the soles may not be thick enough for the hiking we’re about to do. After riding through the fairly large town of Del Rio we set off to find some free Wi-Fi. Jerry had several books that he needed to download and I wanted to check my e-mail. Being off the grid for 24 hours is a strange feeling! We found a Starbucks and I had a latte while Jerry downloaded his books. We also asked a couple of people where we could get good Texas barbeque since we wanted to try it before we go home. They both suggested Rudy’s but first we set out on a hunt to find hiking boots. Jerry’s boots were falling apart – he had glued them back together last night – so we both needed boots but were not willing to spend a lot of money on something that we would only occasionally use. To make a long story short I’ll just say we both found some at the local Rack Room. Mine are Timberland and I know they make a good boot and I really liked the price. Their buy one, get one half off was a real enticement! Afterward we went to lunch at Rudy’s. When we drove up I realized that it appeared to be a renovated gas station. Oh no – memories of the haircut that I got in a renovated gas station in Wisconsin flowed through my brain. When we went in we were met by a server who very nicely explained everything they offered plus he gave us samples to try. The turkey was quite good and the brisket was as well but nothing beat the creamed corn. After we sat down Jerry offered me some of his carrots and I tasted a slice. They were cooked with jalapeno peppers and I have rarely tasted anything so hot. In fact the cooked jalapeno wasn’t that hot. I drank a half glass of water before I even started my lunch. The lunch was ok but not $32 worth! We started back to the campground and along the way saw a sign for Box Canyon and decided to ride down there. Apparently Box Canyon is part of Amistad National Park. We turned on Box Canyon Road, rode 7 miles to a little community, did a U-turn and drove 7 miles back to the highway. I never saw a canyon but we did see a lot of sheep herds – herd? Is that correct? As we drove down the highway Jerry was on the lookout to find a particular set of rocks that he had seen earlier. They had a wavy pattern to them and he wanted to photograph them so when he saw them he whipped the car around, stopped on the side of the fairly busy highway and started taking pictures. Tourists! Really! We passed through the Immigration Inspection station with just a hello and shortly afterward arrived at the campground. We put on our new shoes and headed out for a hike. And why am I doing this? I thought we were just going on a short hike but Jerry had other ideas. 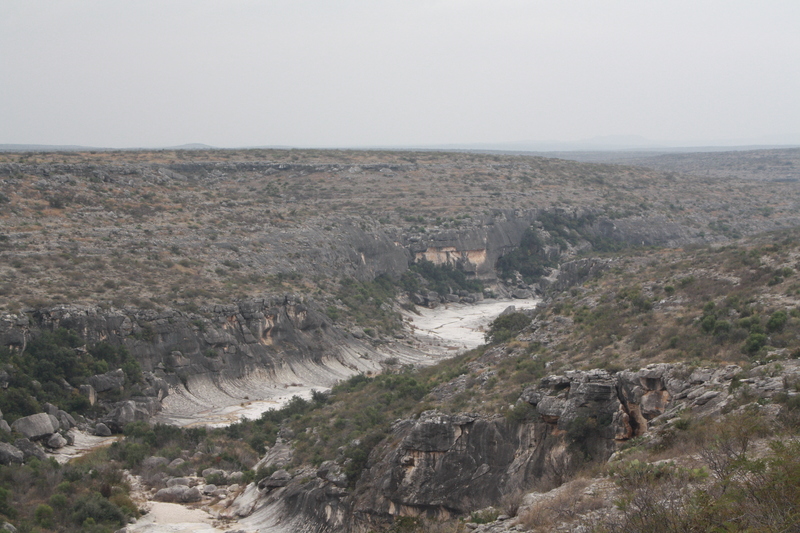 There was a 3 mile hike to Panther Cove Overlook where we could see the confluence of the Seminole Canyon and the Rio Grande and he wanted to go so off we went. 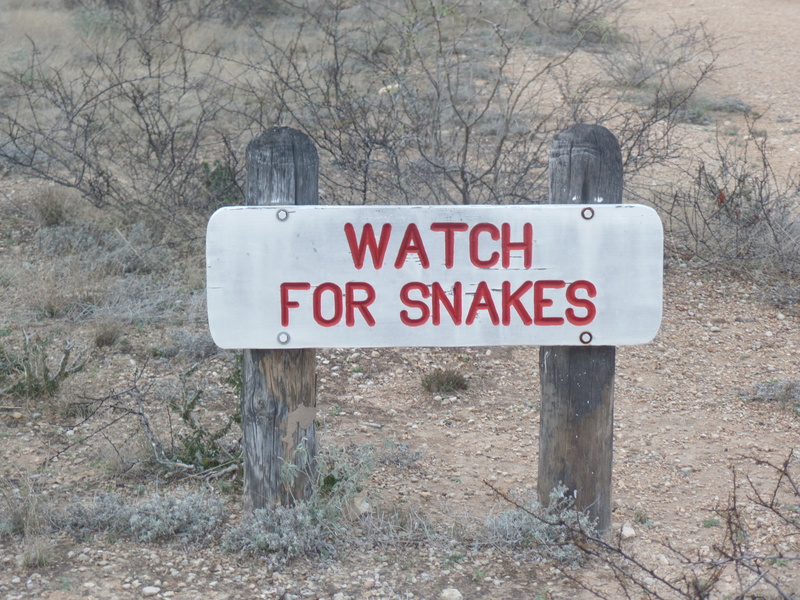 I tried to ignore the sign that said watch for snakes! It probably wasn’t the wisest idea to start the hike after 4:00 but off we went. It is a good hike but some of the path was rocky and made walking a bit more difficult. 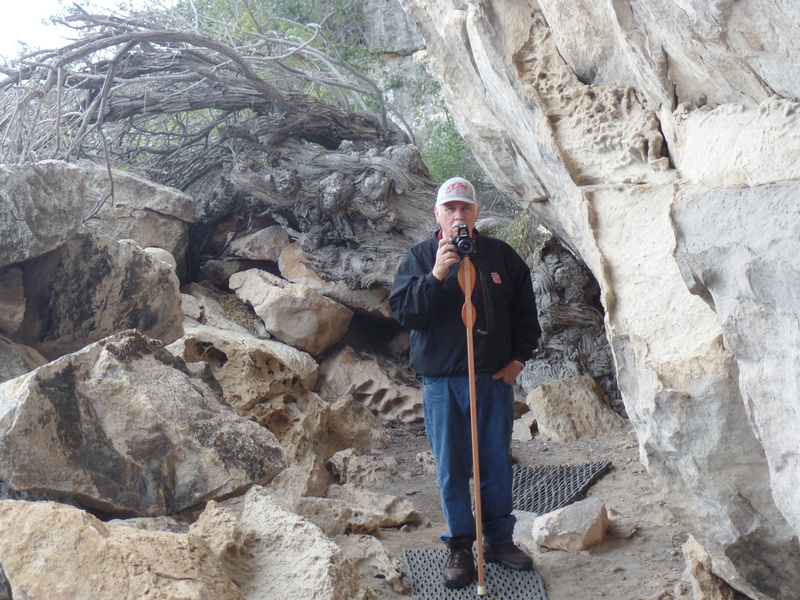 Fortunately we had the walking sticks with us. There were signs along the way that indicated how much further we had to go. When we got there it was well worth the trek. The caverns, the Rio Grande, the entire vista is absolutely breathtaking. We so wanted a picture of the both of us but neither of us had carried our phones so a selfie was out of the question or was it? I had my little camera so we tried it with that and it worked. Unfortunately I had worn my hat because I had thought it might rain and I look like a little Asian lady! Notice the picture is not posted! We didn’t stay too long as Jerry was afraid it would be dark when we got back and we had three miles to go. It wasn’t but it was near dusk. Again, we missed the sunset due to clouds but maybe next week. When we got back to the RV we both collapsed. I thought it was a good prelim to our days at Big Bend and Jerry said “too little, too late”. I don’t know about that but we did break in our new shoes! As soon as I knew the park office was opened I called about changing our reservations. Although she said we could come in today with no problem I’m was not sure what she said about our reservation. We left a bit after 9:00, we just can’t seem to get away much earlier. Of course our two GPS’s gave us divergent routes. 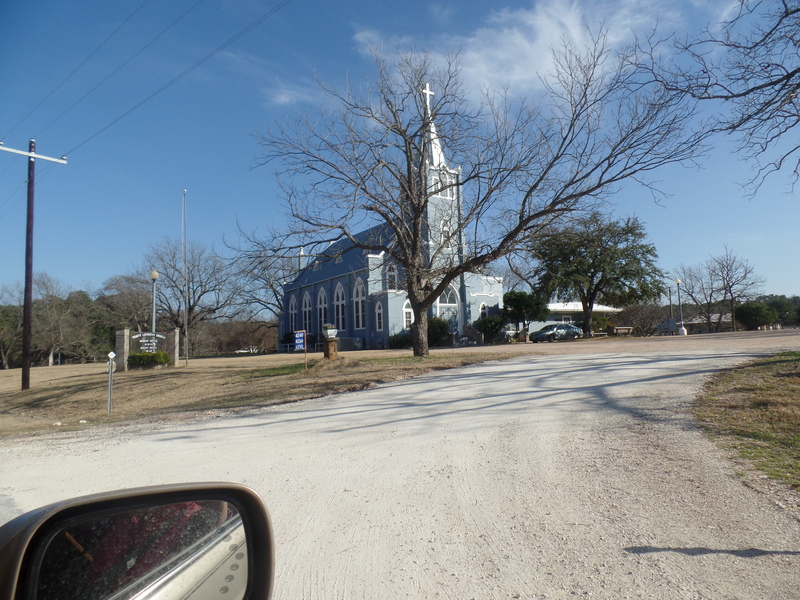 Mine had us going Interstate 10 all the way to Del Rio which would have been an easy drive but it was 75 miles further so we elected to go with Jerry’s Clarion. Actually that too was an easy drive. Texas 14W is pretty much a straight road though it does have some hills and valleys and is just a bit bumpy. In fact, I was bored because the road was so bumpy I couldn’t cross stitch, work on the computer, or read and the scenery was not too much to look at I offered to drive. The only way I’ll ever get better is to drive and this was a perfect place to do it so I drove for nearly 2 hours without incidence or terrified fear – Jerry or me. The road was very bumpy though and there was a lot of road kill along the way. We also saw many herds of sheep and goats. Other than that the land appeared to be barren although as we neared Comstock things began to look a little greener. I saw a couple of signs that indicating a curve and that I should slow down to 65! Really, in NC we slow down to 45 but then the speed limit is a bit different. I had no idea what the speed limit was but I knew I was in no danger of exceeding it! As we were nearing the park we had to pass through Integration Inspection. That was the first time we’ve ever experienced that but they just wanted to know if we were US Citizen and how many people were on board. I didn’t realize that we were that close to the Mexican border but the park is actually only three miles from there. We got to the campground a little after 1:00 and I went in to register. There was no problem changing our reservation but there was a $10 administrative fee – really it took her two minutes. There is also a $3 a day park charge for each person so it added up! We are parked at the very end and have no Internet and no cell coverage. I have sent texts and e-mails to the children alerting them to that but am not sure they received either of them. We will be here until Friday morning. We ate lunch and then went on the walking tour of the Fate Bell Annex and the Fate Bell Shelter. Words simply fail me as I try to describe the majesty and beauty yet desolation of the area. 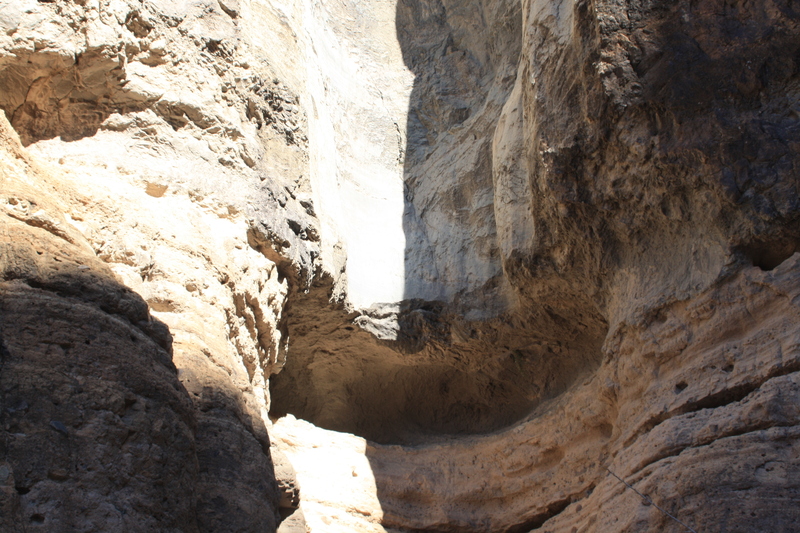 We descended into the canyon where we saw the pictographs put there years ago by the Indians. It is remarkable that they are still visible though faint. The tour guide was very knowledgeable and gave us quite a lot of information. There is little that can be done to preserve them because each remedy would in some way damage them. After the tour we unsuccessfully tried to resend an e-mail to the children telling them that we were off the grid for a couple of days. We were told that the Internet was strong up by the bathhouse so we stopped there and tried again and then sent a text. I have no idea if they received it though. In a way it’s kind of nice to have no cell, Internet, Facebook, etc. but there’s always that nagging feeling of being totally out of contact. When we got back to the coach I worked on my notes for the day and then we went outside to watch the sun set. Apparently it’s quite the routine here as many people were out. Unfortunately due to the clouds the sunset was not remarkable – it was the normal “you should have been here yesterday”. Oh well, maybe tomorrow although there is a 40% chance of rain. I’m sure we’ll see some spectacular sunsets during the next week. Came in, had dinner and then with no Internet and no TV it looks like it’s time to read. I’m quite sure our Dish would work great out here but we have to call to tell them our zip code and since our cell phones don’t work we can’t call so… It’ really going to be a quiet night! It’s funny how age and time can change your perspective. As a young 16 year old mainly interested in my life (rather self-centered I guess) I well remember hearing on the car radio that John F. Kennedy had been shot. I also remember the iconic photograph of Lyndon Johnson being sworn in as president with Jackie Kennedy standing next to him. What I do not remember are the politics involved. At this time my parents were Democrats because quite frankly in the small town we lived in one could not vote unless you were a Democrat – there were no Republicans running at that time. My impression of Lyndon Baines Johnson seemed to be of a haughty Texan but again I was 16 and unfortunately not very interested in politics. 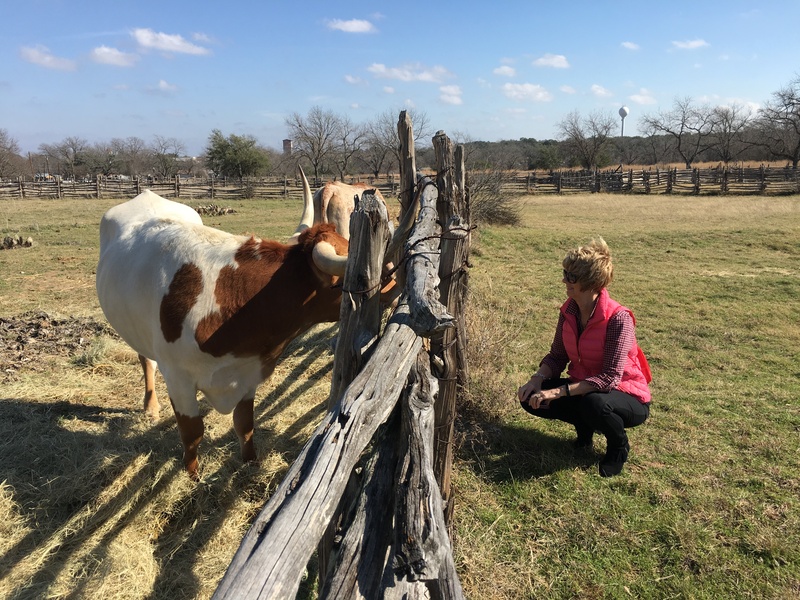 Visiting the childhood home and the ranch of LBJ showed a man with a very humble beginning in Johnson City and then a president who loved his retreat at the ranch in Stonewall surrounded by family and friends. We first visited the museum, got a rundown on what we could see and then took a tour of his childhood home. It was a rather small home for a family of seven. It was restored just as it was when President Johnson lived there. In fact they took out the plumbing and the electricity. I’m not quite sure why that seemed to be important in the restoration though. President Johnson was the oldest of three sisters and one brother. Their mother made sure all five of her children knew that beauty was only skin-deep but character was what was most important. She had a picture on her mantle that looked like a skull but on close examination you could see a lady with her perfume bottles. In other words, to LBJ’s mother what you see on the outside is not always what is real. There is definitely a lesson for us all to remember in the chaos of today’s world. A copy of that picture is still on the mantle in the home place and copies are for sale in the gift shop. After touring the house we took a walk to the Settlement where Johnson’s grandfather and great uncle started a cattle droving headquarters. 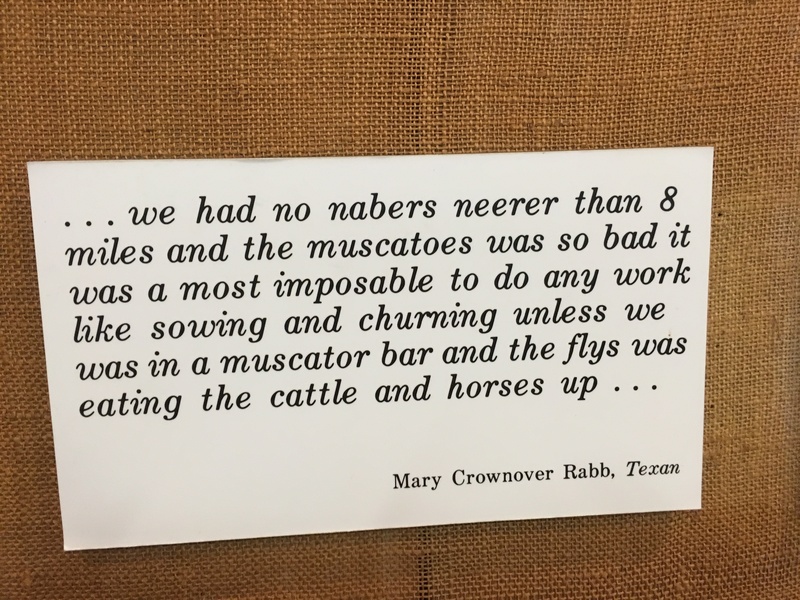 The cattle drives were long and difficult and sometimes deadly. In fact, Johnson’s uncle drowned at a river crossing but it was also very difficult for those families left at home. There is a story of Johnson’s grandmother hiding with her baby beneath her house while Indians search her home and after finding no one they just left with the horses from the barn. We stopped next at the home of Johnson’s grandparents, Sam and Eliza. Sam built Eliza a dogtrot cabin which reminded us of the shotgun houses that we saw in Louisiana. It’s a cabin with a shaded breeze way through which a dog could trot! 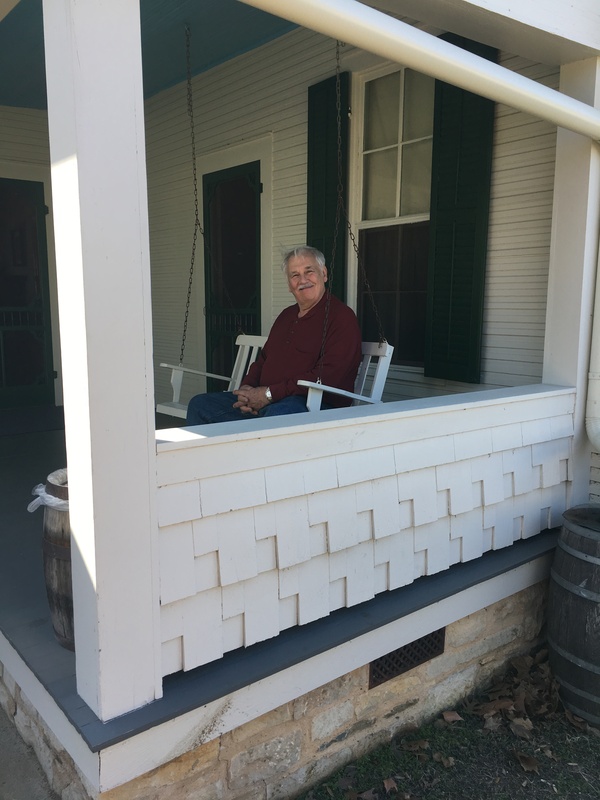 The breezeway was used for storage and also for folks who sought relief from the hot Texas weather. There were two furnished rooms on either side where you could see the period furniture. There was also a taped narration done by Lucy Banes Johnson explaining everything. Finally got to see a long horned cow! I finally got to see some long horned cattle as there are a few right there on the settlement. They boringly ate their hay and paid us no attention. Our next top was back to Stonewall to see the ranch. Interestingly enough the ranch is divided into two parks, one state and one national. Within the state park is a museum, a gift shop and the Sauer Beckmann Living History farm. Across the the Pedernales River is the LBJ ranch operated by the National Park Service. As we rode along the river we saw several people who were fishing. We approached the ranch from a very long winding road which passed the School House where Johnson attended through 5th grade ( the school only went up to the 5th grade so after Johnson’s 5th year they moved to Johnson City so he could graduate from high school). We made a brief stop at the Johnson family cemetery. It is fenced in and there was a sign asking that no one enter. 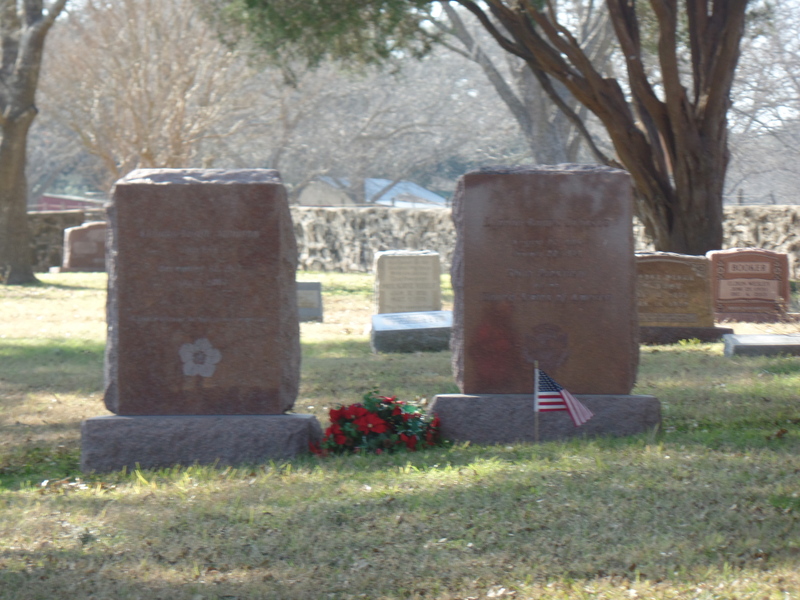 I was surprised to see the monuments for both President Johnson and Lady Bird as they were not big ornate “presidential” moments but rather in keeping with the other family markers in the cemetery. At a distance we could see the beautiful Lutheran church that Johnson sometimes attended. Next to it is the Head Start School which Johnson started. We rode along the road and noticed that cows and deer were grazing and did not appear to be fenced in. It was obvious that they crossed the road at times! I was astounded to see so many deer herds as well as sheep and goats. 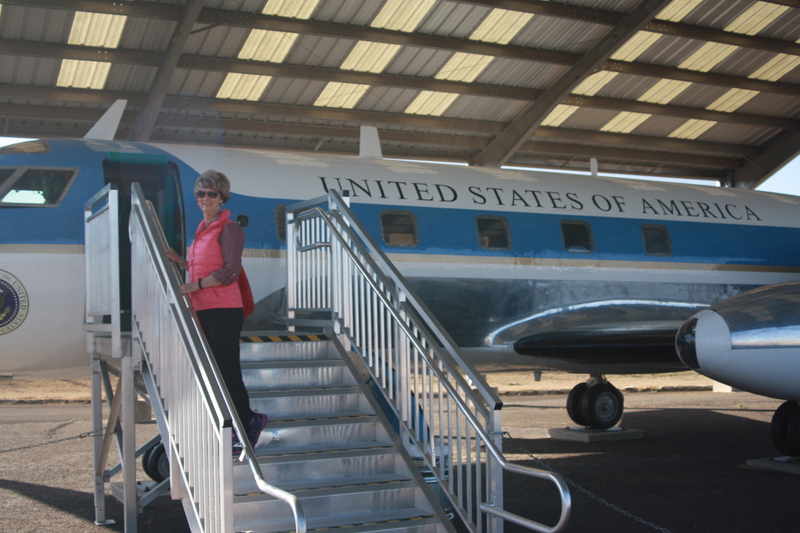 We eventually arrived at the ranch and there was a large airplane, call “Air Force One-Half” because of its size. We could see into the cabin and there was only room for a few people and it only had a crew of three, two in the cockpit and a flight attendant. The gift shop is in the old hanger and it is fairly large with a lot of memorabilia that can be purchased. They also have a lectern with the presidential seal on it. Jerry and I both had pictures taken there. When he took mine he left off the presidential seal. I was going to surprise everyone by being photographed as the first woman president! Next on the agenda was a tour of his house. The house had 72 phones when the Johnsons lived in it as Johnson always wanted one right by him. There was even one beside his chair at the dining table. We only saw the first floor but it is decorated authentically. They must have really liked yellow because there is a lot of yellow there! Throughout the home are gifts that were given to him by dignitaries and the house is also filled with family pictures. It is a lovely home but it is just that – a home. Nothing particularly fancy or over the top. One can see why he loved to return there for rejuvenation. I was particularly interested in the papers for two walking horses that he owned, one sired by Merry Boy. The names were very familiar to me and brought back a memory from my childhood days when my dad and I rode and showed walking horses. President Johnson spent much of his political career trying to lessen for all Americans the hard realities that he knew as a youth: no electricity, poor medical care, inadequate education and prejudice. He actually signed more education bills than any president before or after. We like to visit the homes of presidents and have been to several but this is first one that we have visited who was president during our lifetime. Although it is history to many it’s not really history to us and fortunately gives us insight to the man behind the Stetson. We left the ranch and headed back to the coach with a planned stop at the Texas Rangers station but they were closed and the gate was closed as well. A quick stop at Walmart and then we headed on back to get dinner and get everything prepared to leave for Comstock tomorrow.